My dad was a big believer in raised bed gardening. In fact, it seems that most agree that gardeners who use raised beds are at an advantage–this is especially true in the north, where deeply buried soil tends to warm more slowly. It is also especially true for gardeners who have found it to be impossible to till rocky soil. I currently live in the Ozark Mountains, and I am doing everything that I possibly can to develop garden spaces at my new home. Vegetable gardens require deeper soil and for the vegetables, I am using existing fence areas to serve as a support for climbing plants and tall flowers, like hollyhocks, delphiniums, sunflowers, and I am building raised wooden beds against the fence. The above bed is a 2′ x 4′ cedar raised-bed. Where yu are growing vegetables, you should avoild treated lumber. You won’t want to consume that treatment. I have even seen beds erected from bricks and cement blocks–as well as from sheets of tin. 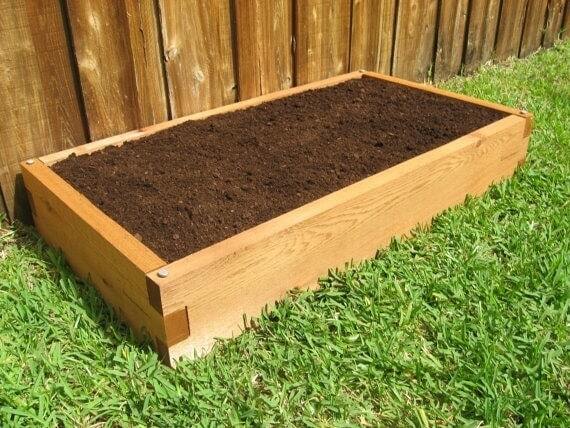 Rule Number 1: Don’t wait until spring to build and prepare your raised beds. While you could definitely wait until spring to do the actual building–the hammering of the nails, the soil prep cannot be postponed. After the frame is built, soil has to be added to the frame, and if you have to buy soil, it will need to be amended. That process cannot be rushed. It is not advised to wait until spring to begin that process. The bulk of plants–especially vegetables and flowers–will not grow in acidic soil, and most bought soil is highly acidic. You will need to add limestone to neutralize the soil, and if you use regular lime, that process will require at least 3 months. Some of the lime claims to be fast-acting. I have not used that product. For best results, add the lime after a rain. In order for the process to begin, the soil needs to be wet. Although it takes years to do so, earth can be created l by composting newspapers, leaves, and grass clippings, and fresh vegetable scraps. The soil creaated this way is also highy acidic and should ultimatey be modified with ime.create will also be highly acidic. My New Jersey garden was not level, and over a course of about 10 years, I successfully leveled many spots through mulching. Next Post Japanese Maples Are Perfect for Small Gardens – They Even Grow in Partial Shade – What is the Difference between Bloodgood and Other Japanese Red Maples?